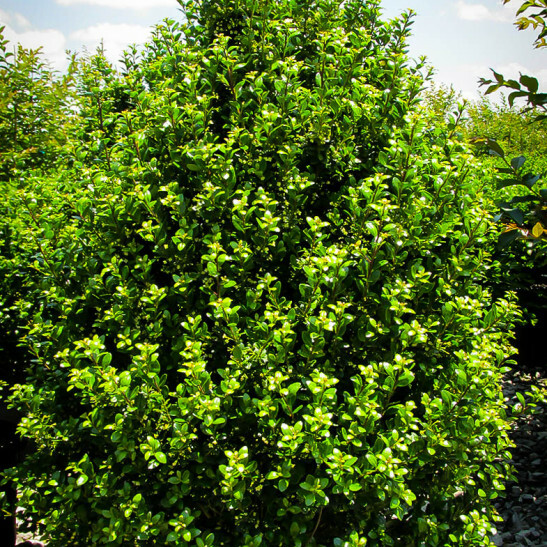 Steeds Upright Japanese Holly is the perfect small evergreen shrub for any garden. It is hardy to minus 20 and thrives across a wide range of climates, so it can be planted almost anywhere. This is a different plant from common holly, with smooth leaves a little like boxwood. It has a strong upright form, reaching 8 feet or more, while only perhaps 3 feet across. 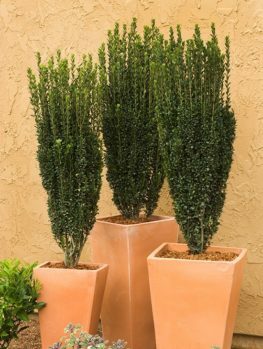 It is perfect for accenting the corners of a home, making dense hedges of all sizes, planting in containers, or for any location where you need the permanence and beauty of rich green, evergreen foliage. This shrub will grow well in full sun or partial shade, in all kinds of soil and it is pest and disease resistant. Planted in rows Steeds Upright Japanese Holly makes a great hedging plant. It can be kept low, or grown into a hedge 8 feet tall, depending on your needs. It will make a dense, impenetrable hedge without requiring constant clipping and always looks neat and attractive, whatever the season. When choosing plants for the garden, we are often attracted to flowering trees and plants, with bright colors. Experienced gardeners know, however, that a beautiful garden is not made with flowers alone, and indeed many beautiful gardens have few flowers in them. What makes a beautiful and satisfying garden is structure – what many designers call ‘the bones of the garden’. The best way to build structure into your garden is with evergreen shrubs. These plants provide a constant backdrop to the changing seasons and give a permanent form to your planting arrangements, while flowers come and go. Evergreens for structure need to be easy to grow, tolerant of a variety of garden conditions, free of serious pests or diseases, steady growing – but not so fast as to need constant attention, and always attractive, with rich, lustrous foliage in a deep green color to complement everything else in your garden. Finding a plant that fits all these requirements can be difficult, but Steeds Upright Japanese Holly ticks all the boxes and more. 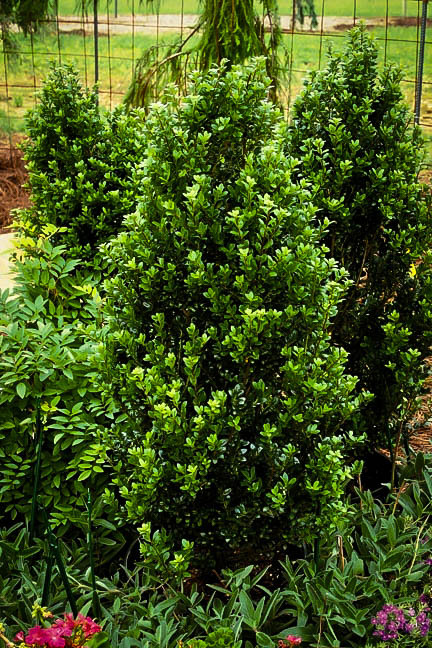 This handsome evergreen shrub is incredibly versatile around the garden. It can be grown as an upright specimen to accent the corners of your home, as part of the foundation planting. 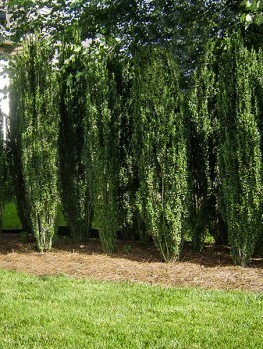 It can be used among other shrubs to create a vertical accent in your planting. 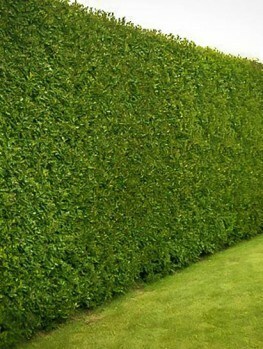 Clip it into hedges from 2 to 8 feet in height, as screening, edging or to separate sections of your garden. 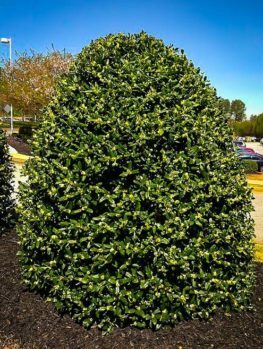 If you have an ugly fence or wall that you need to cover, or you need some privacy from people walking by your garden, Steeds Upright Japanese Holly is the perfect plant to grow for a luxurious rich-green hedge that will be dense and trouble-free. In addition to all the aforementioned uses, it is also a great plant for containers framing an entranceway or door, or in pots around the pool or placed along a walkway. Even in a more natural style of gardening it makes a great, trouble-free background plant that will be neat without any clipping required at all. 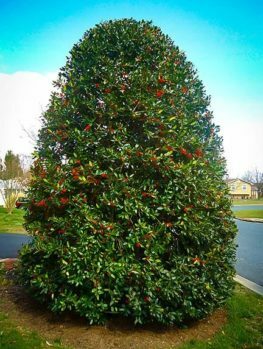 Steeds Upright Japanese Holly is a dense shrub growing to 8 or perhaps 10 feet tall, with a narrow, upright habit, so that with no clipping at all it will make a vertical plant 3 to 4 feet wide. It grows steadily, but always remains neat and can even be left unclipped without ever looking untidy. The leaves are only an inch or so in length, with a smooth edge except towards the end, where there are some very shallow indents. The leaves are glossy, and a beautiful rich green in color. New shoots are a paler green, but as the leaves mature they darken to a lustrous, healthy green color that makes the perfect background for other plants and is beautiful all year round. This holly is a specially selected form of the common Japanese holly, so it must be grown correctly, to preserve its unique characteristics. Our plants are grown the correct way, by taking stem pieces from properly identified parent plants and rooting them under controlled conditions. Avoid cheaper plants, often seedlings, simply sold as ‘Japanese holly’, as these will be irregular in shape and will not give you the symmetry and balance you need. 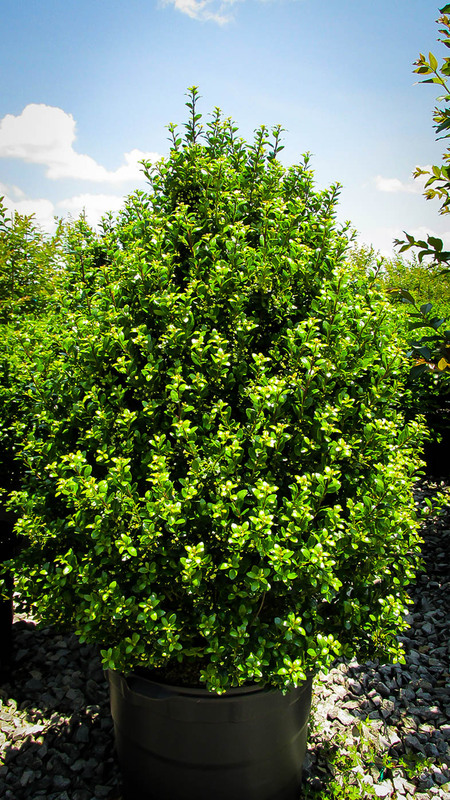 Steeds Upright Japanese Holly will grow well in almost any soil, from moist to dry and from sandy soil to heavy clay. Once established it is moderately drought resistant, but it will also grow happily in moist soil that is well-drained. As well, it will grow in full sun or partial shade. So you don’t need to think about special needs when planting – follow your eye and plant wherever a rich green evergreen accent is needed. Hedges made of this Japanese Holly will be healthy and green all over, as your hedge passes from sunny areas into more shaded ones. 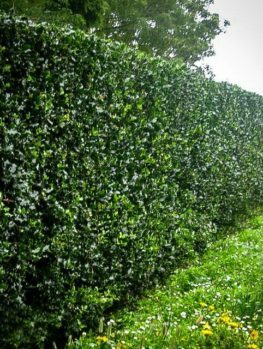 To plant a hedge of Steeds Upright Japanese Holly, place the plants 2 feet apart for a hedge under 3 feet tall, and 3 feet apart for a taller hedge. Space them out evenly along the row, allowing 3 feet clearance from fences or buildings. 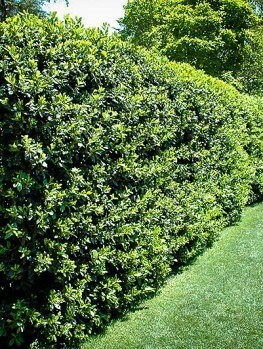 Keep your hedge well-watered for the first season or two, and begin clipping while the plants are small. Clip lightly and often until the plants have reached the height you want, and then clip once or twice a year, depending on how neat you want to be. The more you clip the denser and more impenetrable your hedge will become. Always clip the top a little narrower than the base, so that you keep dense foliage right to the ground for the life of the hedge. Steeds Upright Japanese Holly is a selected form of the Japanese Holly (Ilex crenata). 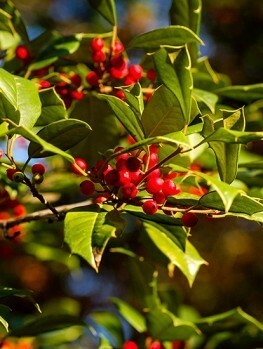 This small holly grows in forests and on hillsides in Japan, Korea, and China. It was introduced to America in the second half of the 19th century and it has been a popular garden plant ever since. If ‘holly’ to you means prickly leaves and red berries, then you are in for a surprise with the Japanese Holly, because the small leaves look a lot like boxwood, and have no prickles. The berries are black, not red, and are popular with birds, smaking your plants useful food sources for winter wildlife. 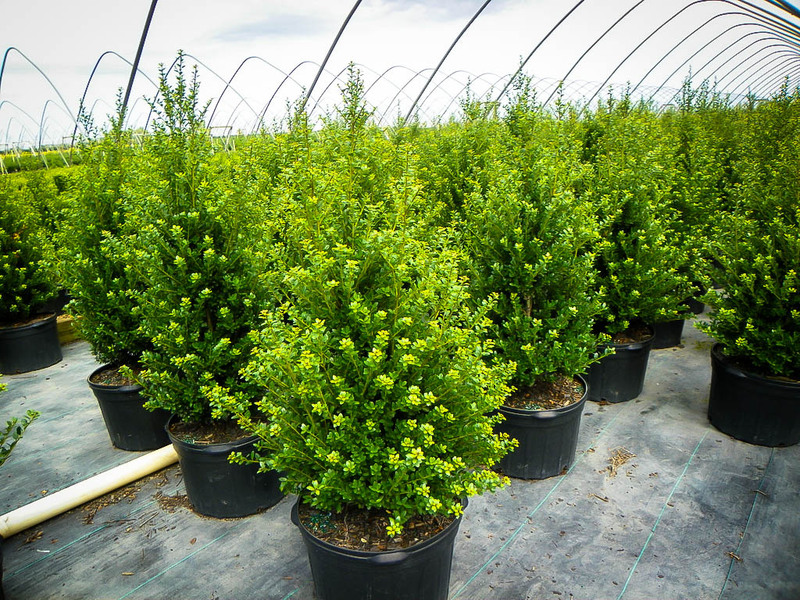 Steeds Upright Japanese Holly is the perfect evergreen for any garden, in almost any location. However the demand is always strong for this superior variety, so we can experience shortages of stock. So to avoid disappointment we recommend you order now and give your garden those essential bones of good design.